Servco is a leader in certified custom design solid surfacing. We are committed to providing superior custom solid surface products for any of your application needs. We manufacture counter tops, vanities, kitchens, wall cladding, kiosks, reception desks, window sills, planters, benches, store fronts, signs, custom sinks (e.g. trough sinks), and much more! Contact us today for a free quote. Airports, Restaurants, Cafés, Retail Stores, Malls, Kiosks, High Schools, Universities, Colleges, Institutions, Hospitals, Nursing Homes, Dentist Offices, Museums, Libraries, Banks, Community Centers, Pharmacies, Fitness Centers, Private Residences, Campers, and much more! Looking for our Plastic Bottles Manufacturing Company? 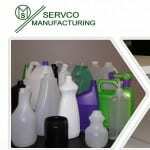 Servco Manufacturing, our Plastic Bottles Manufacturing Division, can still be found at www.servcomfg.com.